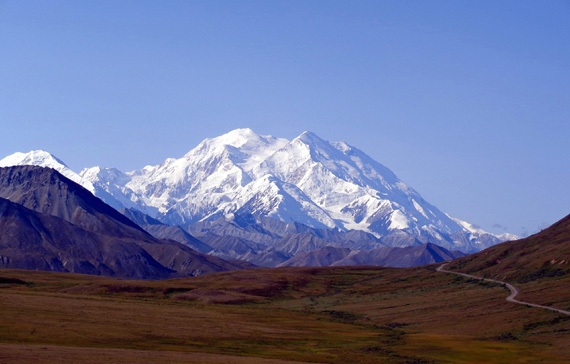 literacy by showcasing research from living laboratories like Denali National Park & Preserve." 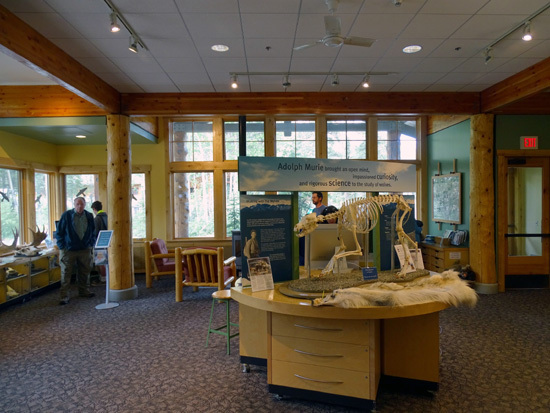 The Murie Science and Education Center is managed by the National Park Service in partnership with the Alaska Geographic Society and other organizations. 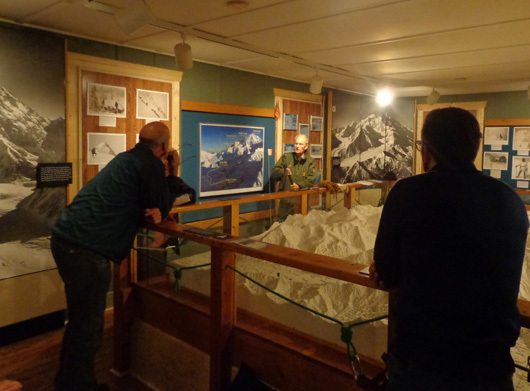 Located just beyond the main park visitor center, it is named for Adolf Murie, a wildlife biologist and naturalist whose extensive study of Denali's wolves, bears, and other mammals helped preserve the biological integrity of these animals in the park. When we visited here three years ago we went into the Murie Center a couple times to learn about wolf, bear, and other research that has been done over the years at the park. We especially enjoyed two of the free wildlife talks that were presented at noon in a conference room at the Center. 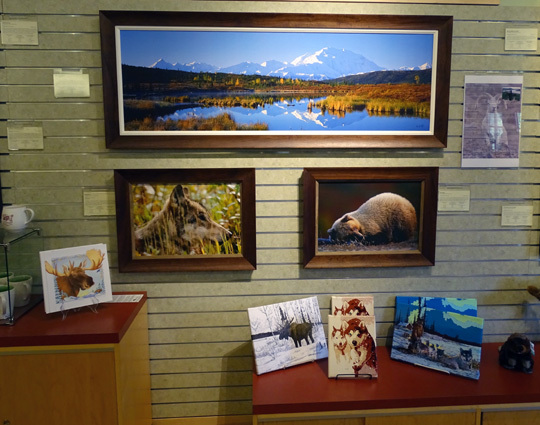 Today was so wet and chilly (50s F.) that it was a good day to run errands and stay inside as much as possible -- inside the Murie Center, main Denali visitor center, and Alaska Geographic bookstore. I felt very sorry for tourists who were here just one day and couldn't see much in the rain but they continued taking bus tours and going out for hikes. You do whatcha gotta do if you have limited time at Denali. 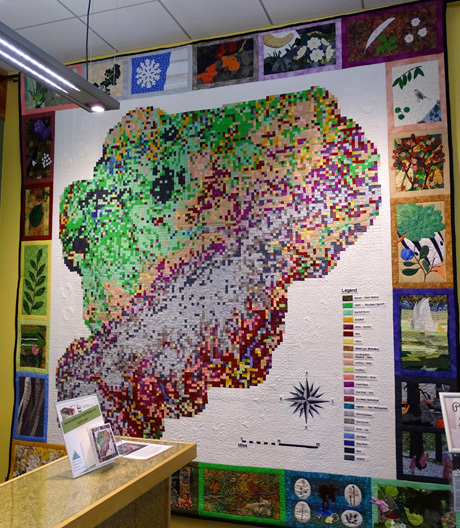 Each color represents a different type of vegetation (shrubs, trees, aquatic) or depicts water, snow, ice, or burned areas. The colors are grouped to show where each type predominates. The border features a variety of leaves, flowers, other plants, water, and snow. 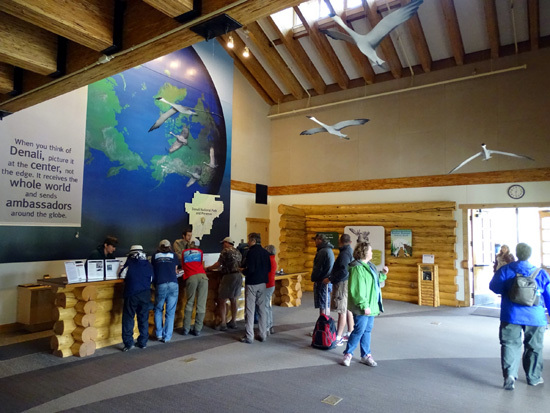 Denali has several visitor information centers throughout the park -- the main Denali Visitor Center, Wilderness Access Center (WAC), and Murie Science Center in the first couple of miles, the Toklat River Contact Station at Mile 53, and the Eielson Visitor Center at Mile 66. 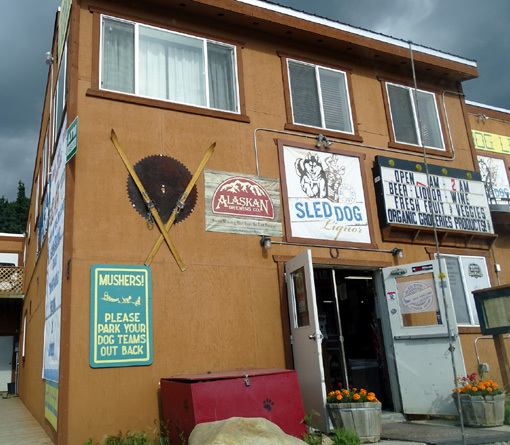 There is also a ranger station located in the town of Talkeetna that serves as the center for mountaineering operations for those who wish to climb Denali and other mountains in the park. 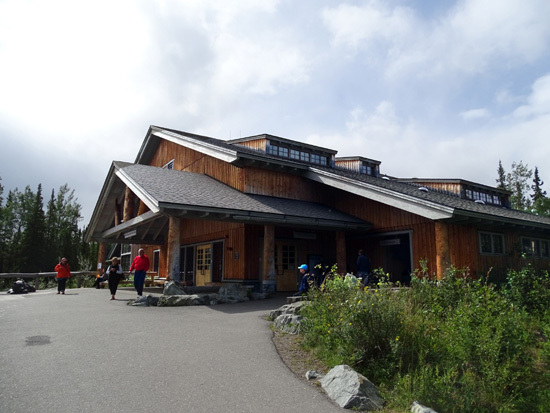 The main Denali Visitor Center a mile inside the park should be the first stop for any new visitor to the park. 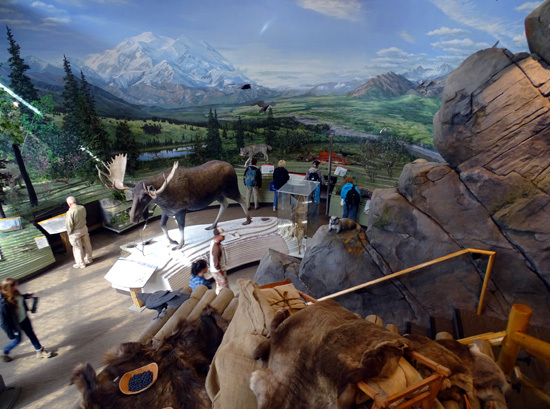 In addition to dispensing all kinds of information about things to see and do in the park, it also has an impressive two-story exhibit hall, regular showings of the beautiful park video called "Heartbeats of Denali" (we enjoyed it so much three years ago we bought the CD), and ranger-led walks and programs. Rangers are happy to answer all your questions about the park. I also enjoyed looking at the Artists In Residence display featuring different art media created by several folks who were invited to participate in the program in 2014. 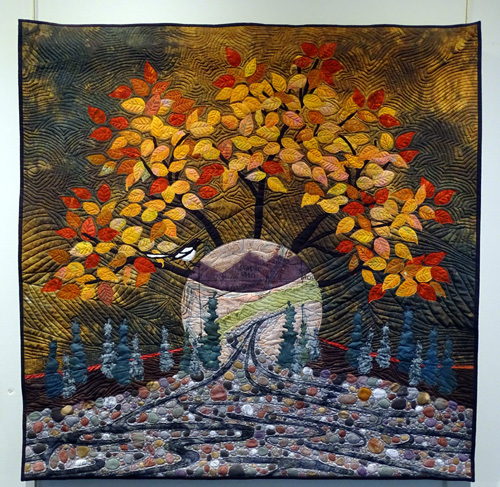 One thing that drew me to the piece was the depiction of the autumn leaves. Jim and I loved all the rich colors in the park during our second visit in late summer/early autumn of 2012 and we hope to experience that magic again this year when we return to the park in late August. 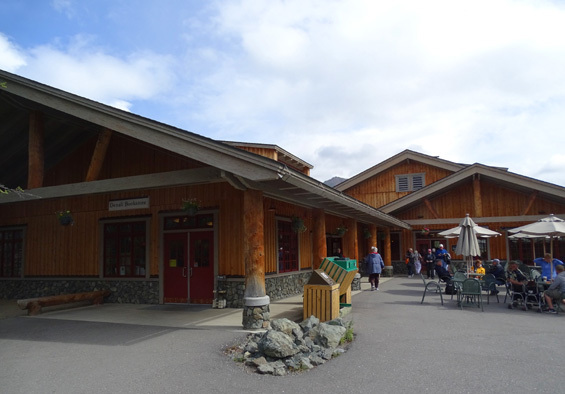 Also in the visitor center complex are a restaurant, bookstore, and the Alaska Railroad depot. 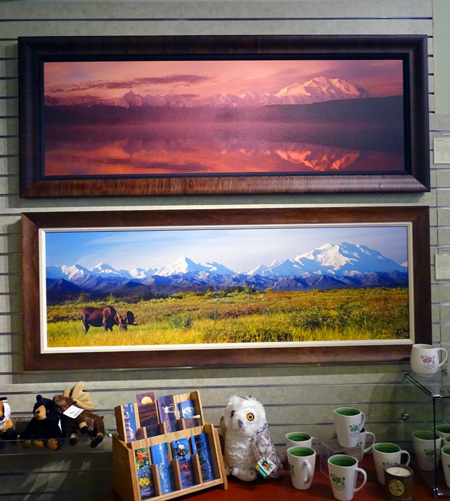 The Alaska Geographic bookstore is a another great place to hang out on a rainy -- or sunny -- day. 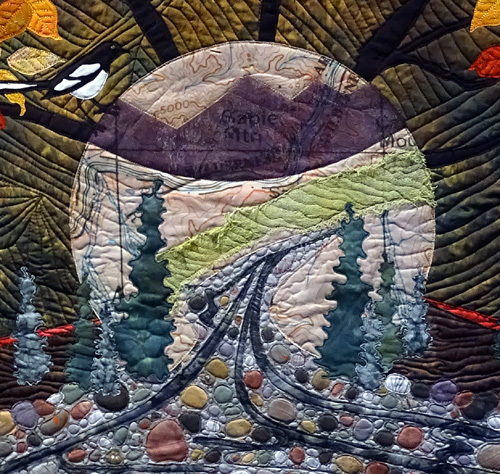 You can find all sorts of quality books, maps, guides, calendars, CDs, note cards, photographs and other artwork, clothing, pottery, jewelry, and gift items here. I could spend hours looking through their wide variety of books and guides relating to Denali National Park and Alaska in general. Their materials are also available online. NENANA CANYON AKA "GLITTER GULCH"
Several hotels, an RV park, adventure companies, restaurants, and all kinds of shops line the Parks Hwy. about a mile from the entrance to Denali National Park. It's a whole different (commercial) world from the natural surroundings in the park and we spend as little time there as possible. The best thing we found to purchase there was Thai food! that tells mushers to park their dog teams out back! 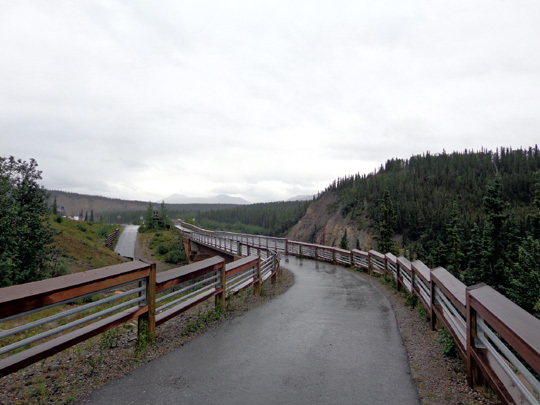 The one thing Jim enjoys about Nenana Canyon is the paved bike path that connects the park with Nenana Canyon. He likes to ride his bike with Casey on the Walky Dog attachment literally "over the river and through the woods" on this path. 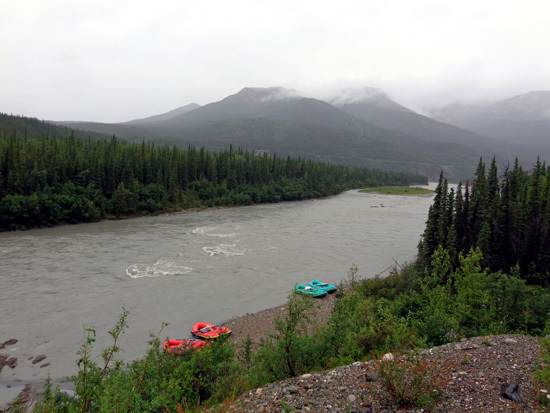 I don't think rafting down the Nenana would have been much fun today, but there are a lot of things to do indoors at Denali National Park on a rainy day if you don't want to get wet.